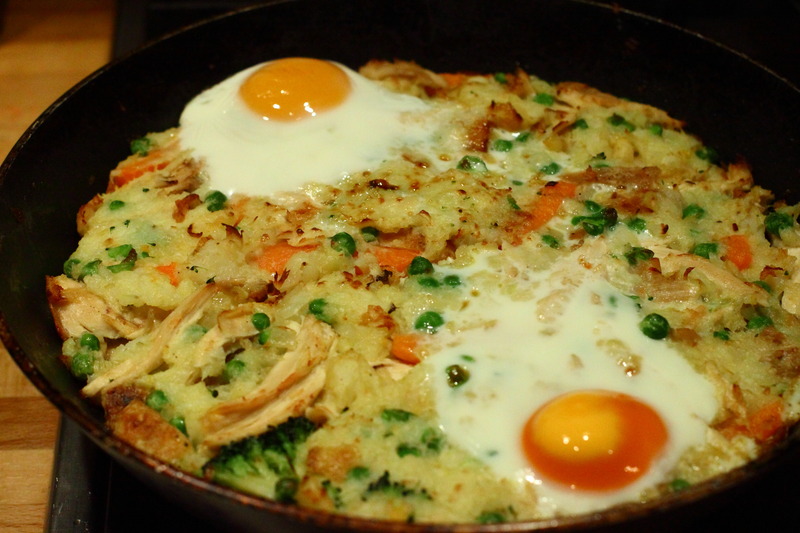 The thing about bubble and squeak is that even the worst cook can’t get it wrong. That’s because, there’s no way to get it ‘right’. It’s just luck! Use whatever leftovers you have from a roast dinner. Stick an egg on top and serve with some gravy if you have it left over. Delicious! All your leftovers from a roast dinner, particularly potatoes. Heat the oil and butter in a frying pan over a medium heat and fry the onions until they start to go translucent. Mash up all the leftovers from your roast dinner. Add them to the pan and push down so they form a solid layer. Cook for about 5 minutes until it’s starting to go crispy on the bottom. Crack an egg on top for each person eating and put the pan under a hot grill to cook the eggs for a couple of minutes. Serve cut in wedges with gravy on the side. This entry was posted in Easy mid-week meals, Family friendly, Vegetarian and tagged Comfort food, Family friendly, Hints and tips, Molly Likes, Quick supper, vegetarian by theclaremontroadkitchen. Bookmark the permalink. There’s a meal that brings me back a bit.